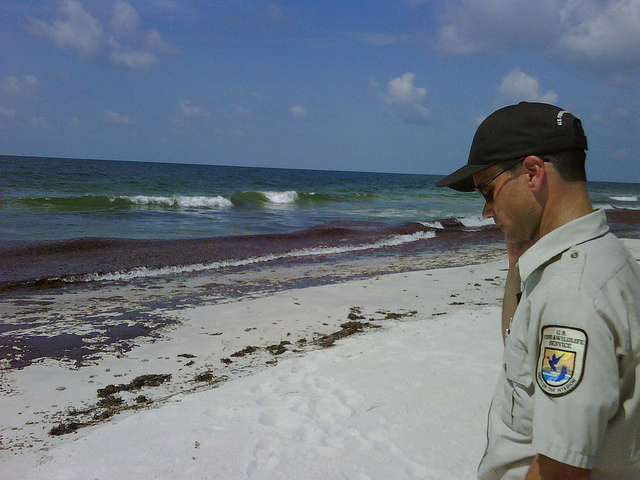 The Gulf Oil spill is old news, right? 2010? Over and done with. The seafood industry has recovered. tourists are back, BP has kept its promises to make things right. We know that because that’s what the incessant BP commercials on television are telling us. BP seems to believe its own commercials, because it announced in June that it and the Coast Guard were ending regular patrols of the Gulf Coast (except for Louisiana) looking for washed up oil. It did this, it said in its exuberant announcement, because of its “extraordinary progress in cleaning up the Gulf,” which, it declared, is almost back to normal. Who you gonna believe? BP’s commercials, or your lyin’ eyes? In June a 20-ton mat of “oiled material” was found off Louisiana, and another two-ton mat was discovered a week ago. Tarballs are a daily sight on the curve of beaches from Louisiana to Key West. Almost all of the oil in these materials appears to have come from the Deepwater Horizon blowout. And before BP virtually shut down its cleanup operations in June, nearly three million pounds of the gunk had been collected — in just six months, off the Louisiana coast alone. That’s the bad news. Now for the really bad news. Mississippi oystermen, who used to harvest 30 sacks a day, routinely, this year are struggling to find six. Grouper fishing takes are sharply down all along the Florida west coast, and many grouper caught have tar balls in their stomachs. The crab harvest is far below pre-blowout norms, and many crabs taken have deformities such as holes in their shells. Substantial numbers of shrimp taken are not marketable because they have large tumors or other deformities, such as a lack of eyes. 212 dolphins and other marine mammals have died this year in the northern Gulf. BP oil is a prime suspect. There’s much more, of course, as any logical person would expect in the aftermath of a dump of 200 million gallons of crude oil into a pristine estuarine ecosystem. Numerous studies have chronicled the harm to corals, micro-organisms, and various species of fish — toxic, carcinogenic and genetic harm. But in the happy TV world of BP — which is vigorously down-playing the size of the spill, rejecting claims for compensation, shutting down its cleanup, and arguing in Federal court that it should not even be fined for the spill — all is well along the Gulf Coast. No scenes of oiled feet, cancerous crabs, eyeless shrimp, dead dolphins. No interviews with bankrupt fishermen or desperate seafood wholesalers. Not here, on BPTV. But so far, only Governor Bobby Jindal of Louisiana seems to have been offended by the fact that BP is “spending more money on television commercials [$500 million last year} than they have on actually restoring the natural resources they impacted.” But as Governor Jindal understands very well when campaigning on his own behalf, perception beats reality every time. And yet millions and millions of us get up each morning and get in their cars and take a drive, apparently oblivious of their role in … well, paying companies like BP to dredge up the muck (and the CO2) from the bottom of the sea. Call us all “Pass-The-Buck” — for it surely isn’t ME doing any of this! Let’s point our fingers at Them, over there! They’re doing it! A connect-the-dots response would be to choose walking as transportation. Bicycles are good for longer trips, too.